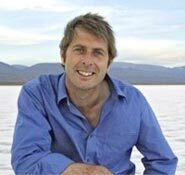 Television's favourite geologist Dr Iain Stewart is patron of the English Riviera Geopark. Iain is the presenter of Journeys from the Centre of the Earth, and the award winning BBC series Earth - The Power of the Planet. He hopes that as patron he will be able to encourage more to share his enthusiasm for the dramatic events and changes which have shaped the English Riviera Geopark over millions of years and to gather support in the wider community for the European Geopark Network. "The English Riviera Geopark is one of the most exciting initiatives I have seen in terms of the quality of the geology and the enthusiasm of the team. I am proud to act as its Patron. The Geopark is great because it is within an urban area, but you can still tell a lot of the story of Britain, and the dramatic changes which have taken place, for example in climate, from looking at the different ages and types of rocks found in the area. . For example down at Hope's Cove you find rocks laid down at a time when Torbay was in a Caribbean-type ocean, then at Oddicombe beach you are among rocks formed in desert, Sahara-type wadis. A geopark is also about telling the human stories, such as when the Ice Age came and what the humans were doing then. I think rocks themselves can be boring. You can pick up a totally nondescript pebble, but when you realise that pebble is there because it was washed down in a desert flood 300million years ago, that's an exciting story." Born near Glasgow in 1964, Iain attended the Royal Scottish Academy of Music and Drama before being cast as a ‘Gorbals Diehard' in the award-winning BBC series Huntingtower. An equity card, miscellaneous television work and various repertory work followed, before his thesbian career ended, age 16, cut short by successful school exam results! Iain's main scientific interests are in the fields of earthquake science and recent geological change. He has organised numerous conferences on this theme both here and abroad, and chairs two international research bodies. He is one of a growing band of earth scientists that are working closely with historians, archaeologists, climate scientists and cosmologists to understand major geological events over the last ten thousand years. In 2003, he was appointed co-leader of a 5-year IGCP Project 490 on ‘Holocene Environmental Catastrophes and Human History'. An occasional media commentator on geohazard issues, Iain's research has featured in two BBC Horizon programmes: The Search for Ancient Helike (2002) and Earthquake Storms (2003). As well as being a geologist on the BBC2's popular Rough Science team, Iain's own 6-part geology series Journeys From the Centre Of The Earth aired on BBC2 in the spring 2005, and a popular science book based on the series was published in April (Century Press). Broadcast in the US by Discovery Science Channel as ‘Hot Rocks', the series won the prestigious 2005 Jackson Hole Film Festival's ‘Best Earth Science programme' award. Currently, he is filming a follow-up series of JFTCOTE on the Pacific ‘Ring of Fire'.